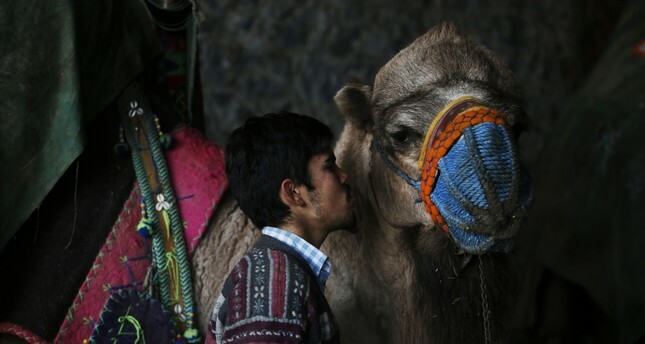 A camel breeder gives a last kiss to his camel before the fight starts in Selçuk, İzmir, Jan. 20. Erol Bilgin has high hopes. His camel, Kara Elmas (Black Diamond), might not have won the beauty contest the day before, but it might well fare better in the main event, the wrestling competition. The two large camels stand face to face, sizing each other up, before throwing themselves head-first at one another. Each animal struggles to bite its adversary's feet to topple them, their long necks interlocking as the crowd cheers. More than 2,000 people, many settled around little tables for picnics, spur on their favorite to win. There are boos too, for those owners down in the arena who intervene too much in the matches. The contests take place in the western Turkish town of Selçuk, at a site just a few minutes from the Aegean coast. In the fighting arena that day, 124 camels wrestled each other in short duels - part of a centuries-old Turkish tradition. Camel culture in Turkey dates back to the Yörüks, a nomadic people whose ancestors were the ancient warrior Seljuks, who arrived in Anatolia during the 11th century. The first camel fight was formally organized in the region around the 1830s, says Devrim Ertürk, an academic at Dokuz Eylül University in İzmir. As the nomads settled, the camels were used for the transport of goods, mainly towards the western ports of Turkey. "And the cameleers started to make their camels fight" in the places they stopped at in the region, Ertürk said. He himself owns several camels, including a two year-old male that he wants to see wrestle in the arena. Nearly 90 such events have been organized to take place in the region from Çanakkale in the northwest to Antalya in the southwest between December and March. This is the reproductive season for camels - when the males who fight are naturally more aggressive - and a quieter period for residents, as agricultural activity slows in the winter. Animal rights groups often call for the fights to end, denouncing them as cruel. But everyone at the arena insisted that all necessary measures are taken to protect the camels, including tying a cord around their mouth to limit the opening and biting. "For a cameleer, their camel is very precious... so the owners do all they can to ensure no harm comes to their animal," said Ertürk. "Many carry the name of the cameleer's children. My father gave my name, Devrim, to one of his camels." One of those in the audience is Abdullah Altıntaş, who has come to watch with his wife, Nilgün. "My father and grandfather had camels, it's an ancestral tradition. Alas, I don't have any but I go to see all the duels," he told Agence France-Presse (AFP). That first day, owners paraded their champions through the town for local people to see. The camels crossed the market dressed in colorful fabrics with their names embroidered on, garlands of bells and the Turkish flag. Bilgin, from the nearby Muğla province, caressed his nine year-old camel Kara Elmas, whom the jury had not favoured this time in the beauty contest. "Obviously each person believes their camel is the most beautiful," he says. The two spend around 10 hours a day together, adds Bilgin, picking a straw from the thick fur of his camel, who he describes as "calm, respectful and sensitive." The next morning, in the dark warehouse where Kara Elmas has spent the night, Bilgin makes sure everything is fine. Because of the long distance they travelled the day before, his camel was "a little agitated but here he was able to relax before the fight," he says. "He knows what happens next." The fights, for which there are no prizes, last a few minutes. They end after one camel manages to topple the other, or forces them to run away. Many of the duels end in a tie, with neither camel able to make the other submit. Down in the wrestling arena with their camels, the owners urge their charges on, trying to push their sometimes uninterested proteges into combat. On occasion, security guards even have to step in to separate owners who themselves have come to blows. When the name of his camel is announced, Bilgin leads Kara Elmas into the arena, parading the animal in front of the spectators before lining him up with his adversary. The two camels throw themselves at each other, each repeatedly brought to their knees as they try to throw each other off balance. But neither falls, the judges declare a tie and the camels are separated. Bilgin is ecstatic. "I am so emotional. He fought very well, beyond my expectations. I am really proud," he says, stroking the imperturbable camel's neck.